How do you feel about driving roundabouts? I know there was a lot of initial opposition to the new roundabouts on Fort King here in Ocala a while ago, but after a bit a research on the subject, I found out a few things that I didn’t know about them and thought you might also find it interesting. Did you know that roundabouts are a safer alternative to traffic signals and stop signs? The tight circle of a roundabout forces drivers to slow down, and makes the most severe types of intersection crashes — right-angle, left-turn and head-on collisions — unlikely. At traditional intersections with stop signs or traffic signals, these types of collisions can be severe because vehicles may be traveling through the intersection at high speeds. With roundabouts, these types of potentially serious crashes essentially are eliminated because vehicles travel in the same direction and at low speeds —generally less than 20 mph in urban areas and less than 30-35 mph in rural areas. 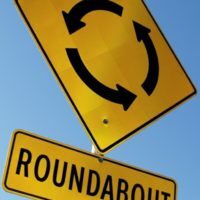 The vehicle-to-vehicle conflicts that do occur at roundabouts generally involve a vehicle merging into the circular roadway or in the case of multi-lane roundabouts, conflicts also occur as vehicles exit. Did you know roundabouts improve traffic flow and are better for the environment? Research shows that traffic flow improves following conversion of traditional intersections to roundabouts. Less idling reduces vehicle emissions and fuel consumption. Did you know roundabouts generally are safer for pedestrians? Pedestrians walk on sidewalks around the perimeter and cross only one direction of traffic at a time. Crossing distances are relatively short and traffic speeds are lower than at traditional intersections. Before you play roundabout roulette, check out this great graphic explaining how to drive in a roundabout at http://www.districtgov.org/community/Roundabout-02-08-12.pdf. Now that I know more, I’m all for roundabouts! Anything that helps to keep us safe out there is a good thing!